Ash Wednesday. We are but dust. We begin the long 40 days of lent. Forty days spent in the desert of our hearts. Dark ashes are smeared on our foreheads, the very place that we were anointed with oil at our baptism and confirmation, to remind us that we are mortal. Remember whom you belong to. Remember where your true home is. Turn back to the lord and do penance. Fast. Pray. Give alms. Learn to love as Christ loves us from the cross. The cross is Christ’s throne of victory over evil and death. But his victory was accomplished through persecution, unspeakable suffering, and through the outpouring of his blood. No human being passes through life without suffering. Suffering is often an obstacle to faith. Yet understanding the crucifixion and the power of the cross is the key to understanding, enduring, and accepting suffering. ..and whoever does not take up his cross and follow me is not worthy of me (Mt. 38). Along the way of the cross we fall face down in the dust and mud of our sin. But Jesus does not leave us down in the muck. He stands ready to help us up if we repent and strive to transform our lives. Lent is a time to turn back to the Lord. Lent is a time to nail our sufferings to the cross. It is a time to conform ourselves to Christ. In the waters of baptism we died with Christ. In those same waters we rose with Christ and became a new creation. Let us remember whom we belong to. In the waters of Redemption. Beyond the numbness and pain. 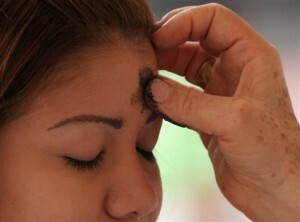 This entry was posted in Liturgical Year and tagged Ash Wednesday, Lent. Bookmark the permalink.